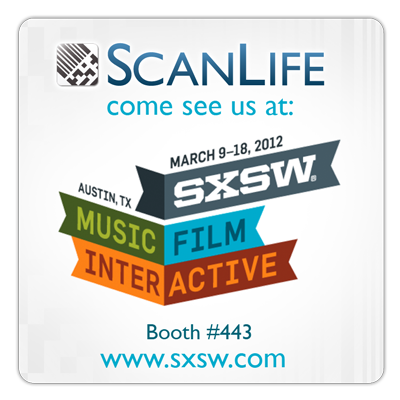 We’re exhibiting at SXSW. Come and join us! 7 Mar 2012 | Author: David J. Year after year, SXSW has proven to be a go to destination for the latest innovations in film, music and technology. The annual media event showcases the brightest minds in up-and-coming technology along with special networking events and programs. At ScanLife, we believe that mobile barcode technology is now the next big thing, enabling brands to engage with consumers in dynamic and measurable ways. Therefore, we’re proud to announce that we’ll be exhibiting at SXSW next week to share out latest innovations with visitors. We’ll also be premiering an exciting new social gaming experience at the event. Each player will receive their very own QR Code to help gain Twitter followers and win prizes. Simple to play, easy to win. Intrigued? Then come stop by our booth! If you’re around, let us know, we’d love to meet you. Also, be sure to follow us on Twitter for breaking updates as the event and contest rolls along. When: Mar 9 – Mar 18, 2012. If you’re going: Meet us at booth 443. More info here.